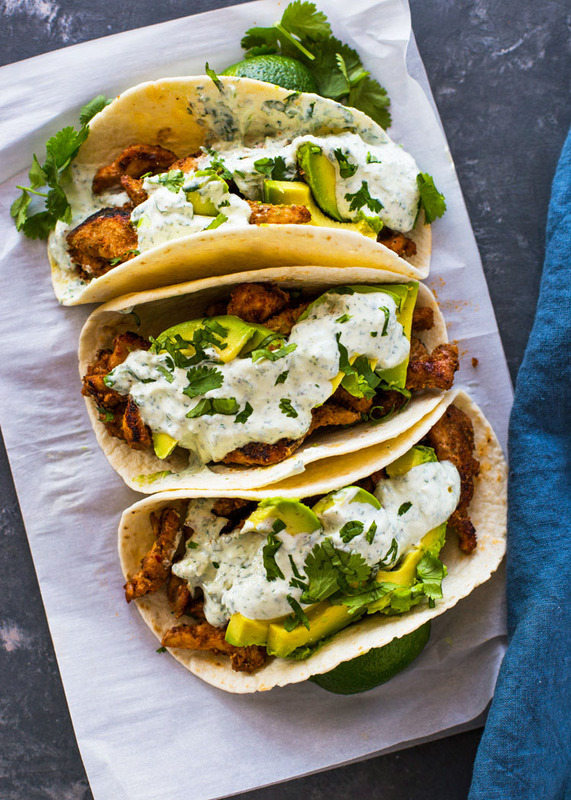 Spicy pan grilled chicken and avocado tacos topped with a creamy cilantro lime sauce. These tasty tacos are bursting with flavor and are made in under 30 minutes! Take tacos to a whole new level with the addition of avocado and my favorite cilantro cream sauce. If you’ve had my popular shrimp tacos, then you’re going to love this chicken version. 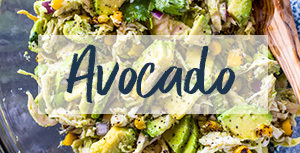 The chicken and avocado make a delicious pair and complement each other perfectly. The real star of the dish is this flavor-packed cilantro lime sauce. 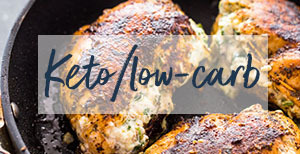 It’s creamy, zesty and makes a delicious addition to the chicken and avocado. The chicken is seasoned with taco seasoning and garlic. 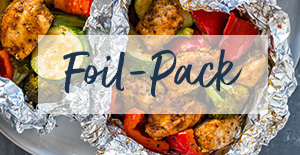 You can use it right after seasoning it or marinate it in the fridge for up to 48 hours. Once you’re ready to cook the chicken, simply cook it on the stove-top in a few teaspoons of oil. 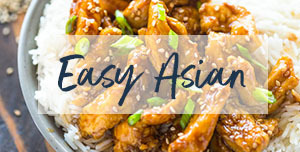 And because the chicken is cut into small bite size pieces, it will absorb all the flavor and chicken will cook in under 15 minutes! 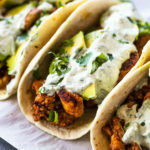 Stove-top grilled chicken tacos topped with avocado and a creamy zesty cilantro lime sauce in under 30 minutes. These tacos are the best! The spices used with the chicken, the cilantro sauce, and the avocado all go together perfectly. I used low fat sour cream and wheat tortillas to cut a few calories out and it was delicious! I will make this 100000x again! I added jalepeno to the sauce. It was a bit bland but it kicked it up for me. I also used shredded chichen that i make and keep in the feezer. Once it thawed, i added the spices and let it sit a bit. Again, i like my spice so i added extra. Esp chili. I may add some cayanne next time. The avacado and suace made this very yummy. My 13 year old isnt a fan of avacado or cilantro but he was happy with the chicken, cheese, and salsa instead. Oh, i added red onion for cruch as a reviewer suggested. Im glad a did. These were great. i used leftover ROTISSERIE chicken and just seasoned. will add this to our regulars. What are the Nutrition Facts??? I have health problems and limited to the amount of sodium and vitamin K. So I need to know those amounts. These are the best tacos! I love the cilantro lime sauce! 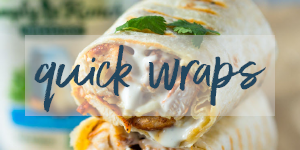 This is seriously the best chicken taco recipe! The only change I made was blending my avocado slices with the cilantro SAUCE.i will make this again and again! Delicious and beautiful to look at, too! 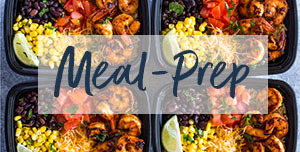 quick and easy to prep. 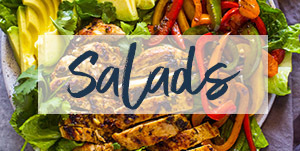 this recipe is going into my regular rotation! These were really good. I wish here was nutrition information such as calories. Just mdae thi. It is so good. Will be making this again for sure. omg these look sooo good! can’t wait to try this recipe! i was excited to make these based on the pic and the reviews. i thought the sauce was bland. husband said it was fine, though. will not make again. This is so amazing. In my top 3 recipes. These are delicious! I added a little bit less than called for on the cilantro, just because we do like it, but not a large amount. It is quick and easy to make!! Really really good. Added some red onion as someone suggested and it Was a perfect addition. Quick and Easy. Will DEFINITELY make again! This was super yummy. I had friends over for dinner and made this. It was a hit! Everyone loved it and wanted the recipe. I let the chicken marinate overnight which made the chicken very flavorful. The cilantro sauce was really GOObbchristy52@gmail.comd…. However I think next time I might add a jalapeño to the blender to add a little more heat. my these were delicious! I also added some red onion as a topping for some crunch. 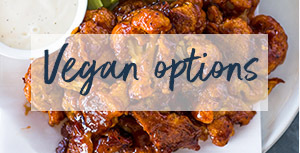 I was not disappointed and will be adding this recipe to my regular rotation. The only thing different I will do next time is double the recipe. Thank you! Does the cilantro sauce stay good for a couple of days? just made these for dinner and they were amazing! They will def be on my menu again real soon! Thanks for sharing! These tacos were AMAZING! Great marinade and sauce! Will definitely make again!